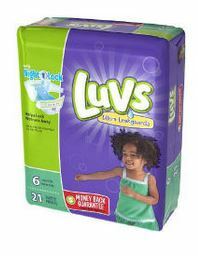 Luvs were my favorite diapers when Bug was a baby. Although I’d buy whatever I could get for the lowest price. My price point was anything under $4.50/jumbo pack for name brand and under $4 for generic. So this deal at Dollar General is what I would call stock up price!